This is the Paragon House edition of the classic work by Marc Prensky. 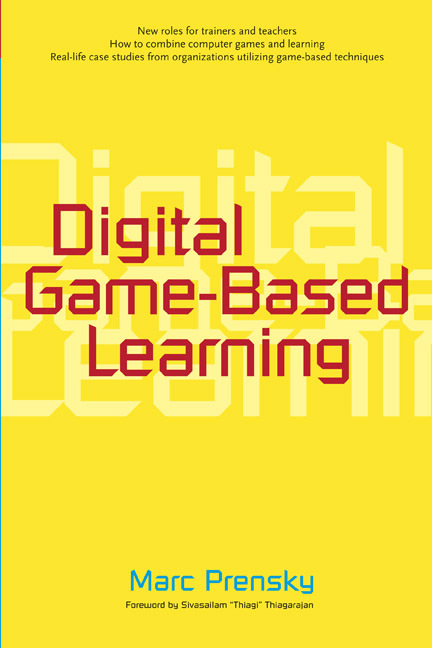 Prensky traces the shift from traditional learning to digital game-based learning. He demonstrates how learners have changed, how digital game-based learning works, its applications, and implementation and shows the role of teachers and trainers in this new arena. Today’s workforce is quicker, sharper, more visually oriented, and more technology-savvy than ever. To truly benefit from the learning power and enthusiasm of this new workforce, training methods must adapt to the way people learn today. Written by the founder of Games2train, this innovative book is filled with examples and information to meet the demands of both educators and employers. Do They Really Think Differently? So What About Attention Spans? Instructional Design —Helping or Hurting? So Why is Change So Difficult? Towards A Learner-Centered Environment:What If the Training and Education World Were Like the Games World? Chapter 5: Fun, Play and Games: What Makes Games Engaging? Summary — What Makes Games So Engaging? How Do You Combine Computer Games and Learning? Business and Political Context —"Being PC"
Digital Game-Based Learning for Preschoolers:Jumpstart,Baby! What 's the Price Tag? Chapter 14: Evaluating Effectiveness: Does It Work? The Evidence: What 's the "It "W are Talking About? What About the Older Generations? What About the Games Companies? Chapter 16: The Future—Where Do We Go From Here?